Monday / Tuesday /Wednesday: Lots of walking / hobbling. Monday, I traveled back to DC. I was crazy sore both these days and walked quite a bit. Thursday: Pure Barre. Ouch. It hurt a ton because I was still sore but this class also helped me work through some of the soreness. Friday / Saturday: Lots of walking and active recovery. Sunday: I ran 3.4 easy miles to celebrate my 34th birthday! It felt good – I just took it nice and slow. Thursday: Two easy miles with a couple of pick ups in the final mile to test my speed. Felt good! Saturday: Six miles with my running group. This was my longest run since the race and I caught up with my friend Christina. We ran pretty easy, about a ten minute mile pace and I felt great! Total run in two weeks post Chicago: 17.4 easy miles. I really think I did the right thing taking this approach with my recovery. I now feel ready to get back in actual workouts, in addition to my easy runs. How do you handle recovery after a big race? I’m amazed that you’ve run as much as you have since Chicago. Your drive is quite inspiring. I can’t wait to hear what your next big race plans are! Of course, I’ve been down the past two days feeling sick! But thanks! Yes – having a plan to follow was helpful for this! I’ve done the no running, but mostly because I mentally need a break from early morning runs, and I want to sleep in. I actually slept in yesterday, and it felt wonderful. I’m not training for anything yet, but it’s always nice to shed the schedule for a little bit after a race. Yes – having some downtime post race is critical for me to be able to sustain hard training periods! 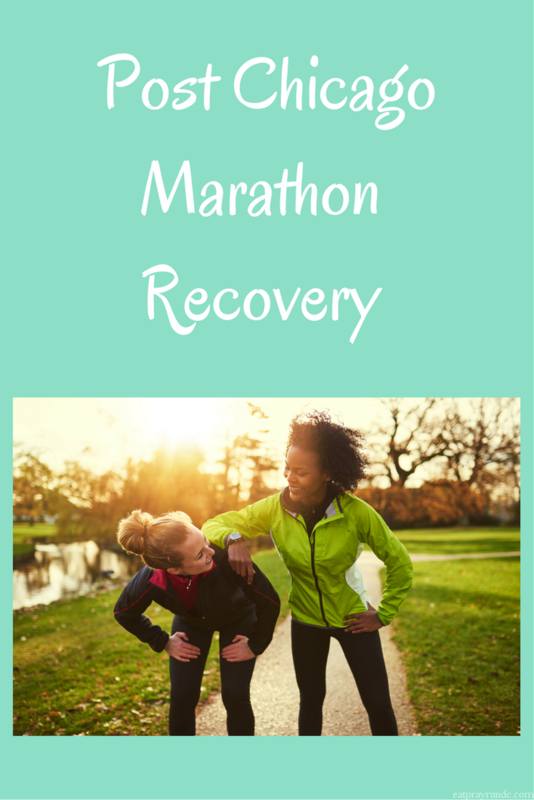 Even though I haven’t made it to my marathon yet, I am curious about the recovery process. Looks like you took plenty of time to rest and recoup! Yes – that rest is VERY important post race! Awesome that you felt so good on those recovery runs. I am planning on taking two full weeks off running. My mind and body are telling me I need it, so I’m looking forward to it! Oh gosh I can’t believe you did barre just a few days after your marathon, you are a brave woman! Your recovery looks spot on to what mine usually looks like. Of course, I also spend a lot of time eating and enjoying the fact that I can stay up late because I can sleep in. I can’t wait to hear what’s next for you! Glad to see that you took advantage of the rest and recovery and are gearing back up for some workouts. I was surprised at how quickly I recovered this time around vs my first marathon and I am feeling ready again myself. I think recovery gets easier (but never easy) each time! After my last marathon, I had to take a client on a week-long custom backpacking trip – needless to say I got in plenty of walking after that race! I try to always take 3-5 days totally off with lots of walking though. I bounced back from Chicago pretty well with this strategy. I like doing easy spinning too. Can’t wait to hear about your plans!